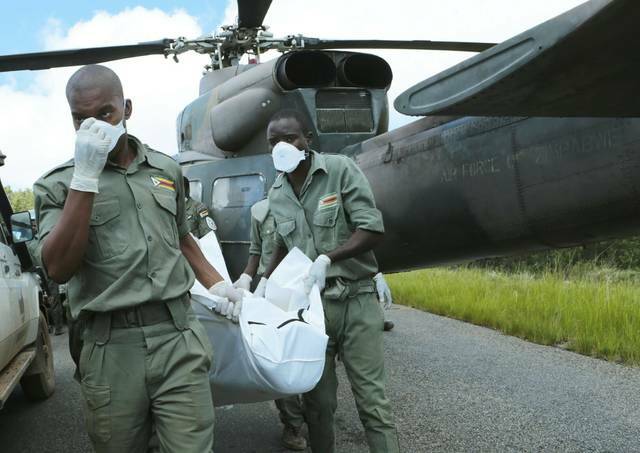 CHIMANIMANI, Zimbabwe (AP) — A week after Cyclone Idai hit coastal Mozambique and swept across the country to Zimbabwe, the death, damage and flooding continues in southern Africa, making it one of the most destructive natural disasters in the region’s recent history. JOHANNESBURG (AP) — Mozambique’s President Filipe Nyusi says that more than 1,000 may have by killed by Cyclone Idai, which many say is the worst in more than 20 years. “It appears that we can register more than 1000 deaths,” said the PR, adding that more than 100,000 people are at risk of life. Nyusi spoke after flying by helicopter over the central port city of Beira and the rural Manica and Sofala provinces in which he saw widespread flooding and devastation. Other officials in emergency services cautioned that while they expect the death toll to rise significantly, they have no way of knowing if it will reach the president’s estimate of 1,000. Beira has been severely battered by the cyclone which cut off electricity, forced the airport to shut down and cut off road access to the rest of the country. Cyclone Idai first hit Beira last week and then moved inland to Zimbabwe and Malawi. Beira has been severely battered by the cyclone which cut off electricity, forced the airport to shut down and closed road access to the city, said the International Federation of Red Cross and Red Crescent Societies on Monday. Cyclone Idai first hit Beira last week and then moved inland spreading heavy winds and rainfall to Zimbabwe and Malawi. More than 215 people have been killed by the storm according to official figures in the three countries, hundreds more are missing and more than 1.5 million people have been affected, according to the Red Cross and government officials. The scale of the damage to Beira is “massive and horrifying,” said Jamie LeSueur, who led a Red Cross aerial assessment of the city. The team had to view the city by helicopter because roads were flooded, he said. “The situation is terrible. The scale of devastation is enormous. It seems that 90 percent of the area is completely destroyed,” said LeSueur. 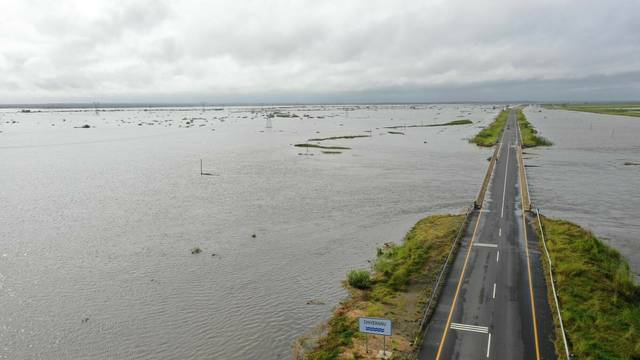 With Beira’s airport closed, the team drove from Mozambique’s capital Maputo before taking a helicopter for the last part of the journey because roads into Beira have been flooded. While the physical impact of Idai is beginning to emerge, the human impact is unclear. “Almost everything is destroyed. Communication lines have been completely cut and roads have been destroyed. Some affected communities are not accessible,” said LeSueur. The storm hit Beira late Thursday and moved westward into Zimbabwe and Malawi, affecting thousands more, particularly in areas bordering Mozambique. At least 126 people had died in Mozambique and Malawi, according to the Red Cross. 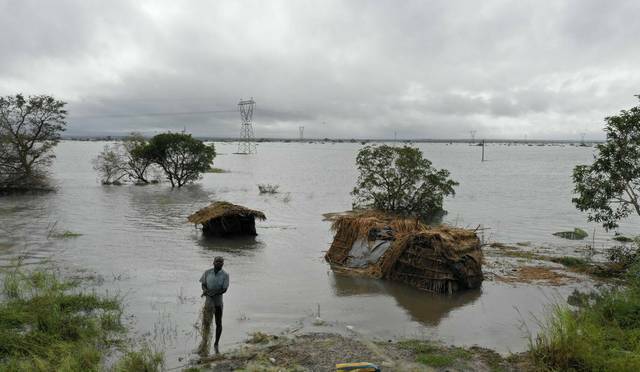 In Zimbabwe, 89 people have died from the floods, the country’s information ministry said Monday. Mozambique’s President Filipe Nyusi and Zimbabwean President Emmerson Mnangagwa both returned from foreign trips to attend to the emergencies caused by the storm. Zimbabwe’s president returned home from the United Arab Emirates “to make sure he is involved directly with the national response by way of relief to victims of Cyclone Idai,” the information ministry said. The Zimbabwean government declared a state of national disaster. U.N. agencies and the Red Cross are helping with rescue efforts that include delivering food supplies and medicines by helicopter in the impoverished countries. JOHANNESBURG (AP) — The United Nations humanitarian office says a tropical cyclone has cut communications and electricity in a major city in central Mozambique after making landfall overnight. A statement on Friday says Tropical Cyclone Idai brought torrential rains to Beira and nearby provinces. An assessment team is expected to arrive in Beira later Friday. The World Vision aid group says more than 500,000 people in Sofala province, where Beira is located, have no electricity. It says the cyclone tore off some roofs and caused part of the Munhava municipal stadium to collapse. Neighboring Zimbabwe is bracing for the cyclone’s effects even as its power is expected to dim while it continues inland. Disclosure statement: Russ Schumacher receives funding from the National Science Foundation, the National Oceanic and Atmospheric Administration, and the Colorado Agricultural Experiment Station to conduct research on high-impact weather and the weather and climate of Colorado. Partners: Colorado State University provides funding as a member of The Conversation US. Wind speed is a function of the “pressure gradient” – the magnitude of the change from higher atmospheric pressure outside the cyclone to low pressure at its center, as well as how quickly the pressure changes over time. This means that a storm that rapidly develops an intense low-pressure region will have persistent strong winds. Wesley Boyer, logged in via Google: as this storm one of the named storms of 2019? What was this Bomb Cyclone’s name? Disclosure statement: Donna Pierce does not work for, consult, own shares in or receive funding from any company or organization that would benefit from this article, and has disclosed no relevant affiliations beyond their academic appointment. Partners: Mississippi State University provides funding as a member of The Conversation US. The Great Red Spot, a storm larger than the Earth and powerful enough to tear apart smaller storms that get drawn into it, is one of the most recognizable features in Jupiter’s atmosphere and the entire solar system. The counterclockwise-moving storm, an anticyclone, boasts wind speeds as high as 300 miles per hour. This prominent feature, observed since 1830, and possibly as far back as the 1660s, has long been a source of great fascination and scientific study. Much about the Great Red Spot is still unknown, including exactly when and how it formed, what gives it its striking red color and why it has persisted for so much longer than other storms that have been observed in the atmosphere of Jupiter. However, astronomers think that its position in latitude, consistently observed to be 22 degrees south of Jupiter’s equator, is connected to the prominent cloud bands in Jupiter’s atmosphere. As a planetary astronomer who studies the atmospheres of comets, I’m normally not investigating massive storms. But I still want to know about the features seen in the atmosphere of other bodies in the solar system, including Jupiter. Studying atmospheres of all kinds deepens our understanding of how they form and work. Unlike Jupiter, the Earth has land masses that cause major storms to lose energy due to friction with a solid surface. Without this feature, Jupiter’s storms are more long-lasting. However, the Great Red Spot is long-lived, even by Jupiter standards. Researchers don’t quite understand why, but we do know that Jupiter’s storms that are located in cloud bands with the same direction of rotation tend to be longer lasting. These colorful alternating bands, called belts (dark bands) and zones (light bands), run parallel to Jupiter’s equator. Researchers aren’t sure what causes the coloration of the bands and zones, but differences in their chemical composition, temperature and transparency of the atmosphere to light have all been suggested as contributing factors. These bands are also counter-rotating, meaning that they move in opposite directions with respect to their neighbors. The boundaries between the bands and zones are marked by strong winds called zonal jets. Like the Great Red Spot, the bands have undergone little change in latitude over the time during which they have been observed. Researchers don’t entirely understand the banded structure, but we do have evidence suggesting that the light colored zones are regions of rising material, and the dark belts are regions of material sinking into the atmosphere. On Earth, there is a well-defined boundary between the atmosphere and the surface of the planet, which is largely covered by liquid water. However, there are no known large oceans of water under Jupiter’s clouds. Based on what researchers do know, the atmosphere smoothly transitions to a liquid hydrogen interior within the planet. There may be a solid core to Jupiter, but it is most likely buried very deep under a thick layer of liquid metallic hydrogen, a form of hydrogen that acts as an electrical conductor. What else do we know about the Great Red Spot that is changing dramatically? Its size, shape and color. An analysis of historical and recently obtained data on the Great Red Spot has shown that it is shrinking and becoming both rounder and taller, and its color has also varied over time. What is driving these changes, and what do they mean for the future of the Great Red Spot? Researchers aren’t sure. However, NASA’s Juno spacecraft, currently orbiting Jupiter, is gathering more data on the cloud bands and the Great Red Spot. These new data will likely provide insights into many of the features in Jupiter’s atmosphere. AP reporter Jeff Baenen in Minneapolis contributed to this report.